My 1-2-3 Cents : Bang! Bang! I was a little surprised Tuesday afternoon as I watched Monday Night Raw on DVR that there was no Hall of Fame announcement made. I had read on Twitter earlier in the day that "the Bullet" Bob Armstrong would be joining Shawn Michaels and "Hacksaw" Jim Duggan in the class of 2011. But if you watched Raw, you know there was A LOT of talking that night. Too much in my opinion, but I'm dedicating this post to the Bullet. Admittedly, I don't know a whole lot about Bob Armstrong. I do remember reading more about him in the Apter magazines than actually seeing him in action. Of course, fans of my generation are more familiar with his sons, specifically Brad and Brian. Brian of course would become the Road Dogg then later BG James. Bob's other son, Scott, is a referee in the WWE currently. In fact, all his boys will induct him into the Hall of Fame on the night before Wrestlemania. 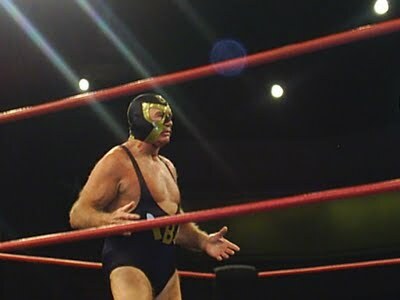 I did have a chance to watch the Bullet (Armstrong's alter ego in a mask). He wrestled former WCW midcarder Bunkhouse Buck at an independent show in a high school gym in Florence, Alabama. I was there as a reporter, covering the matches for the news. That night I got a chance to interview Ricky Morton and his "son" who was actually Kidd Kash. Armstrong had to be in his late 50's at the time, but put on a decent match. This was 1998, so I'm trying to remember the outcome. I believe Buck got disqualified and the Bullet won. That match was the main event of the night and the Alabama fans loved Armstrong. Bullet Bob has a place in the Hall of Fame. It will be interesting to hear some of his history in the business as he gets inducted. I also look forward to hearing from Road Dogg again. Congrats Bullet! Not "Fit" For the WWE? This is the Biggest Show of the Year? Dancing & Cooking with Jericho!